Manchester United are reportedly not willing to entertain the idea of selling Paul Pogba in the summer transfer window. 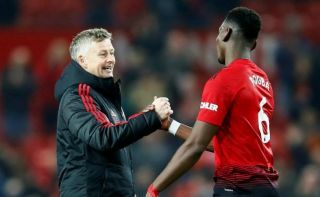 The France international has shown some of the form of his career in recent months, exploding into life since Ole Gunnar Solskjaer came in to replace Jose Mourinho as manager. And according to the Evening Standard, Pogba is seen as a ‘pivotal’ part of Solskjaer’s plans for next season. The report goes on to explain that United also plan to invest heavily in some big names, with their three top transfer targets being Borussia Dortmund winger Jadon Sancho, Napoli defender Kalidou Koulibaly and Sporting Lisbon midfielder Bruno Fernandes. The trio have been linked with the Red Devils in the past and could certainly add plenty of quality in the key areas for Solskjaer’s side. It makes sense that the Norwegian tactician would want Pogba to be a big part of that, with the 26-year-old sure to only improve further with quality defenders like Koulibaly behind him, and attackers like Sancho alongside him.